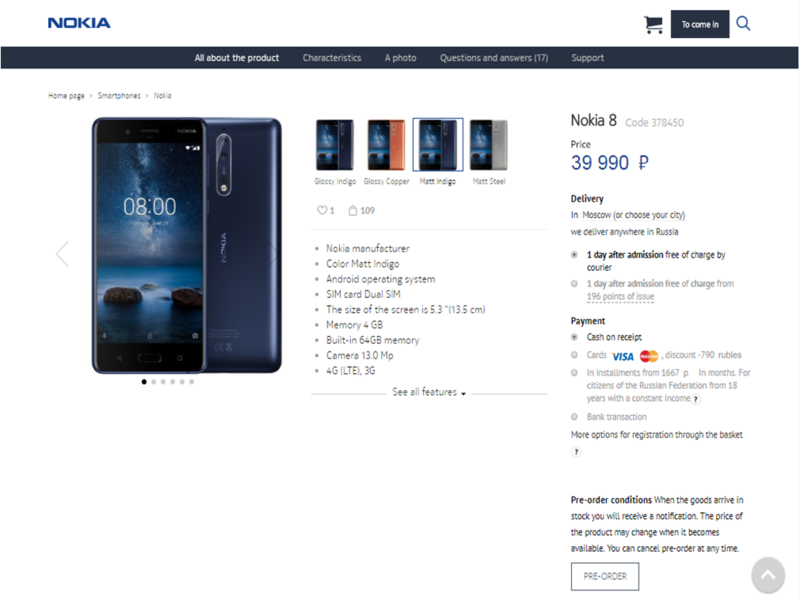 LoveNokia | Latest News and Information about Nokia Mobile: *UPDATED* "Nokia 8 is now available in Russia" | Official Nokia store starts taking Nokia 8 Pre-Orders in Russia!! *UPDATED* "Nokia 8 is now available in Russia" | Official Nokia store starts taking Nokia 8 Pre-Orders in Russia!! HMD Global has started taking pre-orders of Nokia 8 via their official Nokia Mobile online shop i.e. "mobileshop.nokia.ru" in Russia. Nokia 8 was launched on 16th August in London and is expected to reach in the hands of the customers by early next month. Russian operator Megafon.ru has also started taking pre-orders for Nokia 8. Nokia 8 is priced at 39990 Russian Ruble which is around €575 or around INR 43000/-. The phone is priced a little bit less compared to the earlier announced average price tag of €599.